We have THE perfect recipe to give your Thanksgiving an Italian touch! 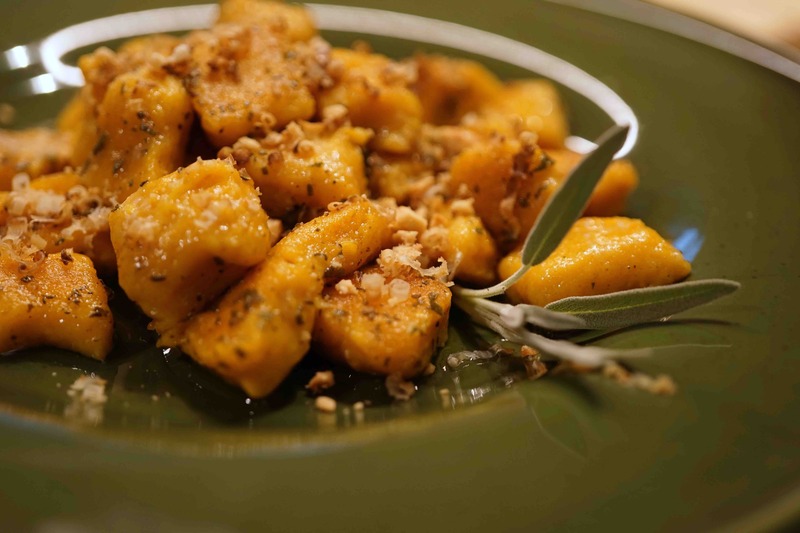 Potato gnocchi are a classic all across Italy, with a number of variations and pumpkin, in addition to being a nice seasonal touch, adds flavor, color as well as smoothness. Picking the right potatoes is key: choose the starchier/floury kind. Older ones work better than newly harvested ones because they have lost some of their moist via evaporation. Same goes for the pumpkin, you want to pick the least watery variety. Bake the pumpkin at 355°F for about 20 minutes or until cooked through. Peel, deseed and pure the pumpkin using a fork or a blender. Boil potatoes skin on, until cooked through. Peel and mash the potatoes while still hot. Once they have cooled, on a clean surface mix potatoes, pumpkin, flour, egg, a pinch of salt and nutmeg. Don’t over work, and if it feels too humid add some extra flour. 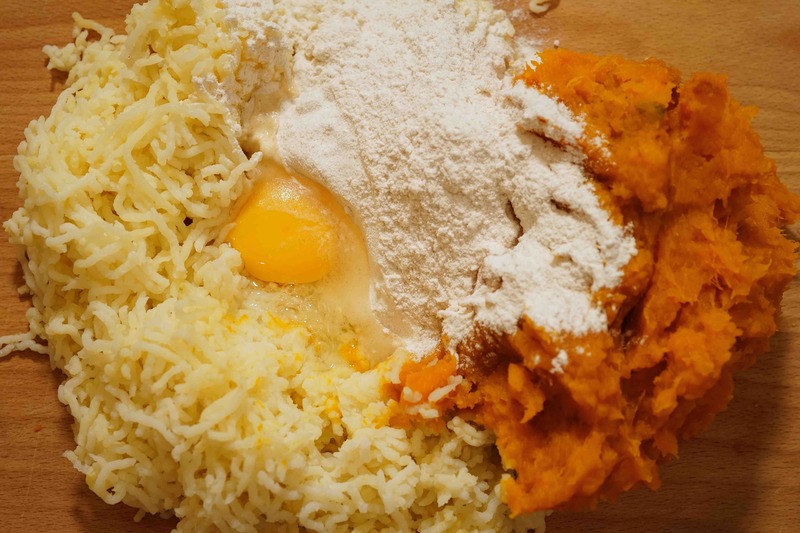 It really depends on how much humidity you have in the pumpkin and potatoes, but you don’t want to exaggerate with the flour, otherwise that’s all you will taste and your gnocchi will be rock hard. 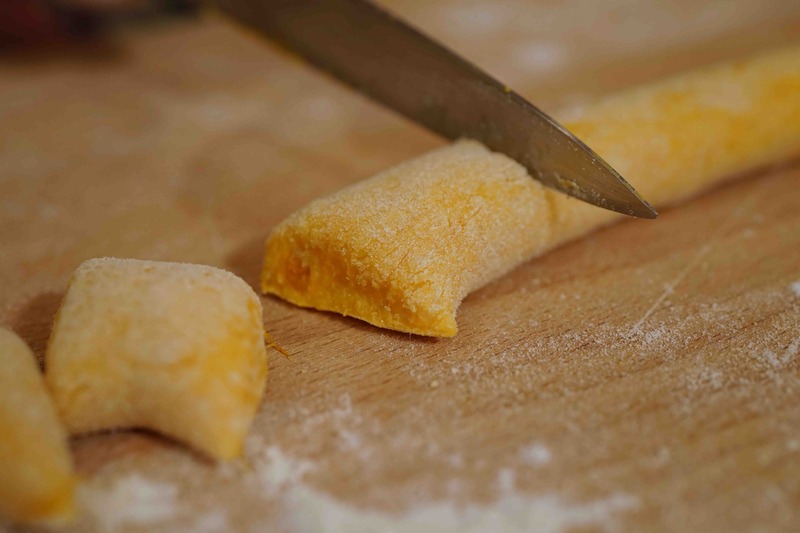 Once you obtain a smooth and firm dough cut it into pieces, roll them into sausage-like strips and chop them with a knife into bite size parts. Use a little flour to dust your work surface every time it gets a little sticky. Cook gnocchi in a pot of salted boiling water. They don’t take long, once they rise to the surface they are ready. On the side in a pan melt butter and brown it with some sage (whole or chopped). Sautée the drained gnocchi in the butter for a minute, adding pepper and the grated parmigiano reggiano cheese. Serve with freshly grated ricotta affumicata and crushed hazelnuts.